What can you do to prolong and preserve the quality of your fresh roasted coffee? It's easier to do than you might think! The quality of your freshly roasted coffee can be greatly impacted by a number of external elements. Among them are sunlight, oxygen, temperature, and moisture (see below for more detail). If not stored properly, whole bean coffee can begin to loose its fresh roasted quality as early as one week, and ground coffee as soon as one hour. In order to protect your freshly roasted coffee from Storehouse Coffee to you, we package using high quality, heat sealed, foil lined bags with one way de-gassing valves, which eliminates exposure to sunlight and oxygen. But what can you do to prolong and preserve the quality of your coffee once it reaches you? Protecting your coffee against these elements is actually easy to do. I recommend storing your coffee in an air-tight container and placing the container in a cool, dark, dry cabinet at room temperature. 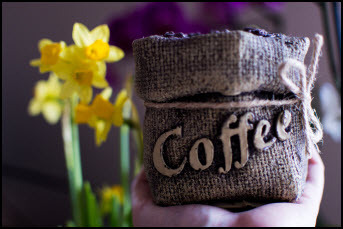 Using a dark, solid or at least an opaque container will protect your coffee from the harmful effects of sunlight. A clear container will work, but keep it out of direct sunlight. UV Rays will cause coffee to go stale very, very quickly. Use an air-tight container, if possible, or something as simple as a canister that allows you to 'burp' out the air. Exposure to Oxygen will speed up the natural aging processes of your coffee by oxidizing the volatile flavors, quickly removing the just roasted qualities. If you do not have an air-tight container, keep your coffee in the bag it is shipped in; roll it down tight (squeezing the air out) and close it with tape. Room temperature is best for storing your coffee. Avoid areas that have wide swings in temperature such as near an oven, stove, or dishwasher. I recommend finding a place inside a cool cabinet or drawer for storing, and away from any are that could produce moisture. It is not advisable to store your coffee in the refrigerator or freezer. While refrigerator and freezer storage may "seem" to prolong the overall life of your coffee, this is a common misconception and the negative effects of such storage are far, far worse. Refrigerators are very humid and contain moisture and odors. Coffee is a porous product and just as baking soda will absorb food odors, so will coffee. You don’t want your coffee to smell or taste like left over’s. Coffee will absorb extra moisture, which can staleness, change of flavor, and even mold. Just like a refrigerator, odors can get into freezers and your coffee could be tainted by these odors. Additionally, and more importantly, freezer storage will draw the natural “oils” and moisture out of your coffee leaving it flat and lifeless. Long term freezer storage could also result in freezer burn. Order your coffee from us in small enough amounts that you do not have to store it longer than a a few weeks to a month. Store your coffee in an air-tight container placed in a cool, dark, dry cabinet at room temperature, away from light and moisture. Excellent advice and spot on! As a longtime consumer of gourmet fresh roasted coffee I buy only beans and grind my coffee right before I brew it and in an 8 cup maker or individual pour over cup. Amazenly better flavor and aroma. Also why I only buy no more than a 30 day supply at a time from a top shelf small batch roaster like Storehouse Coffee!